Why does hitting PlayStart on my Sequencer Change TETRA Program? 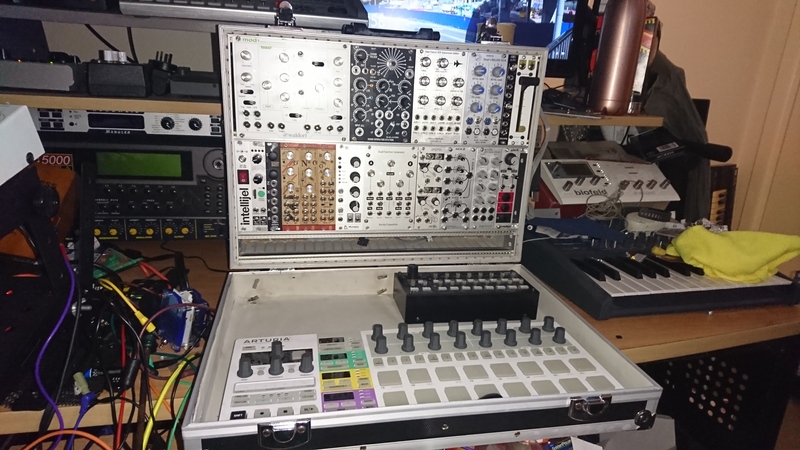 This sounds like a TETRA question, but I think it's really more of a question about MIDI sequencing a synth, so I thought this forum would be a good place to ask it . . . . I'm pretty much a MIDI newby so I apologize if the answer to this question is obvious to most of you but here goes . . . I'm trying to sequence my DSI TETRA synth with the MPC Live in standalone mode. The TETRA is not very easy to navigate and program (for me, anyway) but I've matched the MIDI channel and I'm able to sequence the TETRA and to change the TETRA programs by changing the program number in the MIDI program section of the MPC's main page. But I don't always get the program that I want . . . The problem I'm having is that quite often, when hit PLAY START on the MPC, the program changes on the TETRA. And it changes to the same TETRA program regardless of what program number is selected in the MPC MIDI program area. If I'm playing a track previously created using the MPC sequencing the TETRA, it works fine, and if I stop the Track and then hit play again, the track starts playing the same program sound in the TETRA. BUT, if I hit PLAY START instead of play, the program on the TETRA jumps to a different program. And it's the same program. For example, it might keep jumping to a certain sound regardless of what Program I choose in the MPC. And I tried using local control on the TETRA to select the Program, but it still changes when I hit Play Start on the MPC. And the TETRA keeps assigning different program numbers to the same sounds. In other words, when I hit Play Start on the MPC, a TETRA program previously located at Group 3, Program 76 in the TETRA will change to Group 3, Program 75 (on the TETRA screen) when I hit Play Start on the MPC. Bottom line is that I'm not able to sequence the TETRA sound/program I want because it changes when I hit Play Start on the MPC! Re: Why does hitting PlayStart on my Sequencer Change TETRA Program? Is your sequencer sending MIDI data other than transport control messages when you use them? Sounds as though you are getting prog change/reset message being sent with the play message. Go through your MPC Live manual and see if it mentions what is sent when you reset a sequence. I will try/check that to see if it solves the problem. One thing I forgot to mention is that when I tried using the available (third-party) online software editor for the TETRA, just to learn the TETRA and experiment with changing some synth parameters, the programs were constantly changing on me. I was not able to select the ones I wanted and the number/patch assignments were totally fluid. I would click on the name of a specific program/patch and then it selected a different one or changed the name and number of the one I clicked on with my mouse. I don't know if that was due to a problem with the editor or a problem with the TETRA itself, but it seems like this should never ever happen. Again, I'm a newbie at all this, but it seems like the patch/program location names and numbers should be absolutley fixed and immutable. Otherwise, it's like swimming in quicksand. Much appreciated . . . Check from the list editor (Menu - List edit) of MPC if there is a program change recorded at the start of a sequence and change or delete it. Another thing to try. You can copy the notes from sequencer and paste them to another track, clear (Main page - pencil - Clear) the original track and paste the notes back. Use the marquee tool and copy soft button (Hold Shift-button in piano roll) from the screen, so that it only copies the selected notes. Edit: On the MPC Program change messages are 0-127 and the Tetra uses 1-128. So Program 0 on the MPC is actually Program 1 on the Tetra. Oh the joy of needing to the event editor to strip out prog changes inserted by patterns associated to a patch. It's one of the reasons I stopped using the pattern sequencer on my QY700 and started printing them to it's track sequencer (and chewing up the event count). Interesting to hear it's how Akai are working with their MPC sequencing. I'd like to think that they'd have taken into account that sequencing external instruments is how a large number of users would be utilising their machine and have an option to switch off prog change messages being send out of the box (though I'd have thought that Yamaha would have done the same 25yrs ago also).